Today Thursday 5 September was a momentous day in the long history of the Highland Clearances when the directors of the Highland Clearances Project a £5 million project to create a lasting memorial to the Highland people who were swept from the land and shipped to many other parts of the world and especially the United States and Canada. The project at Helmsdale was given another push today when the founding director of Clearances Centre Ltd, Dennis MacLeod, the mining entrepreneur, wasl joined by some of his directors to reveal the latest developments. Also present was Councillor David Green, chairman of Inverness Highland 2008, who is supporting the project, as well as internationally-acclaimed sculptor Gerald Laing, Kinkell Castle, (See Below) who had a model of the clearances icon on show. The £5 million project to create an international focal point for the commemoration of the Clearances as well as a celebration of the "Highland Diaspora" will take a major step forward soon with the appointment of a high profile professional fund-raiser to drive forward the exciting international initiative. 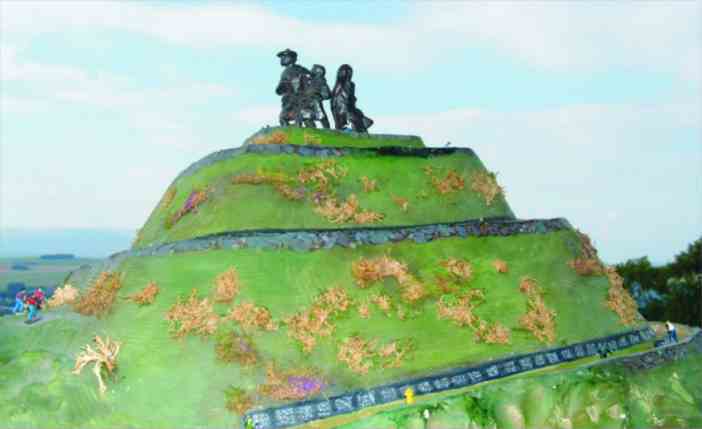 A model of the proposed monument - notice the scale of the statues. The postholder will be expected to travel throughout Scotland and the world to promote the Highland Clearances Project at Helmsdale, Sutherland, and persuade descendants of "cleared" families to support the project by way of donations ranging from £5 to £150,000. The Clearances Project will be developed in three phases and should be fully operational by 2008, when Inverness and the Highlands hopes to be the European Capital of Culture. Inverness Highland 2008 Chairman Councillor David Green fully backs the project, which has the promise of creating 10 full time jobs and initially attracting 35,000 visitors each year by the fifth year of operation, with an ultimate target of 100,000 visitors per year. Founding Director of Clearances Centre Ltd, a Scottish-registered charitable company is Mr Dennis MacLeod, a native of Helmsdale who now lives in Scatwell, Strathconon. Recent appointments to the board of directors of Clearances Centre Ltd. include Mr David Sutherland (Chairman of Tulloch Ltd), Mr Alex Grant (Joint Chairman of Norfrost), Mr Calum Macdonald (Runrig songwriter and musician) and Mr John Webster (Chairman Webster Logistics, Winnipeg, Canada). They join directors, Councillor Margaret Paterson, Mr Edward Mackay of Edward Mackay Ltd, and Miss Annie MacLeod, crofters' representative. The Patron of the project is Lord Mackay of Clashfern. The vision of the board of directors of the project will be expressed in four ways. The centrepiece will be a statue, which will consist of four bronze figures mounted on a spiral plinth. They depict a clearance family and consist of a father gazing out to sea, his wife looking back up the empty glen and their two children. The statue, or clearance icon, will be located on top of Creag Bun-Ullidh at a height of 600 ft above sea level. The complete structure will be bout 120 ft high with the statue forming the top 30ft, supported by a 90ft spiral plinth in the form of an ancient hill fort. Access to the site will be via 10ft wide path winding up the hill from Helmsdale. Standing Stones, each 10ft high, will be located at regular intervals along the access path. They will be stylised versions of the ancient standings stones found throughout the Highlands and will tell the story of the Clearances. It is hoped the Standing Stones will be sponsored by communities from throughout the world. It is proposed to record a roll of the names and addresses of those descendants who, by donation, show their support for the project. It is expected that the majority of such donors will be persons who have an ancestor who was cleared from their home in the Highlands and Islands, whether by eviction or economic hardship. The name of the descendant or sponsor will be inscribed on the support wall descending from the statue. This will be known as the Wall of Descendants. The final element is the creation of a Clearances Centre, which will be an archives and genealogy facility. It will use state of the art information and communications technology. It will encompass a museum containing artefacts from the clearances; a clearances archives section; an emigration archives section; a Diaspora archives section; a cultural archives section and a Hall of Fame, recording the achievements of both famous and ordinary Highlanders. More than £100,000 has been spent on the project to date. Outline planning consent has already been granted, and agreement reached with both landowner and crofters over the use of the land. Work on construction of the icon is underway by Gerald Laing, the internationally acclaimed sculptor, who is based at Kinkell Castle, Black Isle. The project itself has been the subject of a rigorous Feasibility Study by independent consultants, together with a recently completed Business Plan, which strongly recommended a phased programme with the Statue, Standing Stones and the "Wall of Descendants" forming Phase 1 and the Clearances Centre forming Phase II. These studies have shown the project to be economically robust with the capacity to have a major economic impact on East Sutherland and with significant benefits for the Highlands as a whole. Mr MacLeod said: "While the project will record the history and culture of the Highland people over the last 250 years it will be most of all a celebration of the achievements of Highlanders and their descendants throughout the world. "Too often descendants arrive in the Highlands on a mission of pilgrimage only to wander aimlessly in search of their roots. The Clearances Centre will provide the kinship of common heritage and the knowledge, which will direct them to more specific locations throughout the Highlands and Islands. The project will be focused on the Highland Clearances, but it also recognises that the clearance of people also occurred in other areas of Scotland. This will be a project that will commemorate the diaspora of an ancient people and the contributions they made to our world. The project must therefore be on a scale that is a fitting tribute to our people." He said the capital cost of the Clearances Project was large and the need to raise substantial funding from individual, community and corporate sources was vital to the overall viability of the project. A target of £1.2 million was required via non-public sector sources over the next two years. He added: "It is clear that attracting funding donations on such a large scale will require considerable expertise. It is intended, therefore, that a dedicated, full-time, fundraiser be employed on a 2 year contract to raise the national and international profile of the project. The fundraiser will be required to operate locally and at a global level necessitating significant, overseas work. Extensive travelling will be required in places such as North America, Australia and New Zealand, from where at least one third of individual, community and corporate-level funds are expected to come. In short, this will be a genuinely global fund raising project and the postholder will be expected to operate at the highest level on an international stage." Councillor Green said: "This project fits perfectly into our plans for the year of culture. It will be a tremendous asset to the Highlands and will be a truly international attraction. There are 10 million Highland descendants overseas with huge potential for tourism, business and cultural linkages associated with the Clearance Project. "Sutherland and the Highlands as a whole benefit enormously from international connections and undeniably the proposed sculpture/centre will be a strong marketing icon for overseas and domestic visitors alike. Equally significant, the project has strong synergy with the bid for "European Capital of Culture 2008." Rita Finlayson, the local Highland Councillor, said: "The Project is entirely consistent with the Sutherland Partnership's Tourist Action Plan which, amongst other things, seeks to capitalise on the area's rich cultural heritage. Similarly, the project fits squarely with the aims and objectives of the recently approved report "Tourism in the Highlands:Towards 2005" as part of a co-ordinated attempt to unlock the undoubted niche market potential of social history/genealogy throughout the Council's area." 1976-77 Visiting Professor of Painting and Sculpture at the University of New Mexico, Albuquerque. 1978 Established bronze foundry at Kinkell Castle with assistance of the late George Mancini. 1983 - 84 Worked in Aspen, Colorado and Brixton, London. 1987 - 95 Royal Fine Art Commission for Scotland.